IoT-driven blockchain platform IOTA announced the upcoming release of real-world integration with vehicle manufacturer Volkswagen. The Digital CarPass, set to be released in 2019, will see performance data tracked via IOTA blockchain technology to ensure vehicle data collection is reliable and secure. The Digital CarPass was announced by Volkswagen’s Head of Blockchain Benjamin Sinram at the Ecomotion “Smart Mobility meets Blockchain Technologies” event in Tel Aviv last week. The Digital CarPass project is the main point of cooperation between IOTA and Volkswagen, first revealed as a proof of concept earlier this year at Cebit 2018. The initiative revealed at Cebit, focused on delivering trusted vehicle software over the air via the Tangle network, the new CarPass project is aimed at capturing reliable data from Volkswagen vehicles in order to improve efficiency. Sinram, speaking in Tel Aviv, stated that Volkswagen wants to integrate IOTA blockchain technology in order to allow users to deliver new services and pay for them autonomously. In addition to working on the Volkswagen/IOTA Digital CarPass project, Sinram works on blockchain integration with luxury sports car subsidiary Porsche and the Volkswagen financial services arm. Volkswagen’s IOTA-enable CarPass is one of five blockchain initiatives currently under active development by the vehicle manufacturer. Sinram states that Porsche is currently developing a blockchain-based identity solution that will allow multiple individuals to share vehicle access. Other Volkswagen projects include a supply-chain oriented open ledger that will track vehicle parts from manufacturer to customer, as well as a “charging protocol” that leverages Ethereum technology. 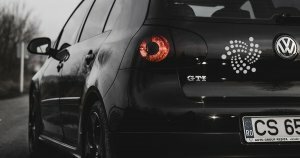 Integrating blockchain technology into Volkswagen vehicles, states Sinram, allows the manufacturer to prove the current software version of a vehicle in an accident, delivering public proof of data integrity. Following up on the release of the Trinity mobile wallet earlier this year, IOTA announced the release of the Trinity Desktop beta wallet. The new desktop wallet draws from the Trinity mobile wallet, but is optimized for desktop use, offering a range of streamlined. In addition to the release of the new desktop wallet, IOTA is making significant progress in furthering the adoption of the Tangle-driven blockchain, recently running a one-week Google Design Sprint with Audi Think Tank Audi Denkwerkstatt in order to create a low-level prototype of a permissionless mobility ecosystem. The post IOTA and Volkswagen Will Launch Blockchain-Enabled Cars in 2019 appeared first on CryptoSlate.